Located in northwest Iowa, Dickinson County is home to more than 17,000 people who enjoy the best of lake living, right in their own backyard. The close-knit and friendly communities that surround Iowa’s Great Lakes draw more homeowners each year to discover what all the fuss is about – limitless recreational activities, a strong economy, good schools, low crime rates and being out on the water! Many of the county’s towns and lakes share the same names including Spirit Lake and Okoboji. Okoboji, located north of where East Okoboji and West Okoboji lakes connect, is well-known for more than its wonderful lakes. 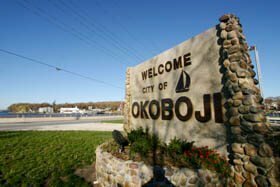 The mythical "University of Okoboji" was “founded” by Milford locals who created a school crest and started promoting the school motto, "where fun in life is your degree." It is not uncommon to find visitors asking locals where this fictitious university is located. The university name and crest is used to support and sponsor various community activities and fundraisers promoting the Iowa Great Lakes Area. 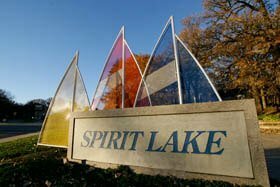 Spirit Lake is located along the northwestern shore of East Lake Okoboji. Residents enjoy a small-town atmosphere – afternoons spent at the Little League Park or out on the lake. Branches of Iowa Lakes Community College and Buena Vista College are also in Spirit Lake. 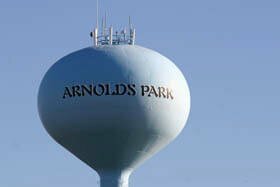 Arnolds Park is located south of the Okoboji Lakes and is home to the longest running amusement park west of the Mississippi. Historic Arnolds Park is a popular summer destination for residents and visitors alike to enjoy a wooden rollercoaster, other rides, carnival games and delicious food and snacks. Live performances and other special events also take place at the amusement park. Milford, "the gateway to the lakes," is located at the southern end of the lakes area and offers great, small town living in a progressive setting. It is here where you can find Three Sons clothing store, the birthplace of the University of Okoboji. Many small towns and communities dot the landscape across Dickinson County, and many residents commute to the towns of Okoboji, Spirit Lake, Arnolds Park and Milford. Tourism is an important business for residents, especially during the summer months. Dickinson County also has several large manufacturing companies that employ many local residents. Berkley-Pure Fishing produces fishing supplies and equipment, while Polaris Industries manufactures ATV vehicles and Victory motorcycles. Klaussner Corporate Services, Inc. is also a local employer that designs wood and upholstered furniture. Before they can enjoy the lake, most students in the county attend Okoboji Community Schools and Spirit Lake Community School District although children in outlying areas attend Harris-Lake Park Community School District and Terrill Community School. Once the homework is completed, the possibilities are endless! Hoien Realty welcomes you to call or email to learn more about Dickinson County, its communities and its lakes. If you are looking for a Okoboji REALTOR®, choose Hoien Realty! As your Okoboji real estate experts, Hoien Realty can assist you with all of your home buying and selling needs. We can provide you with access to the local listings database and offer our experience and knowledge to make the home buying or selling process easier for you and your family. Contact Hoien Realty today to get your home search started!